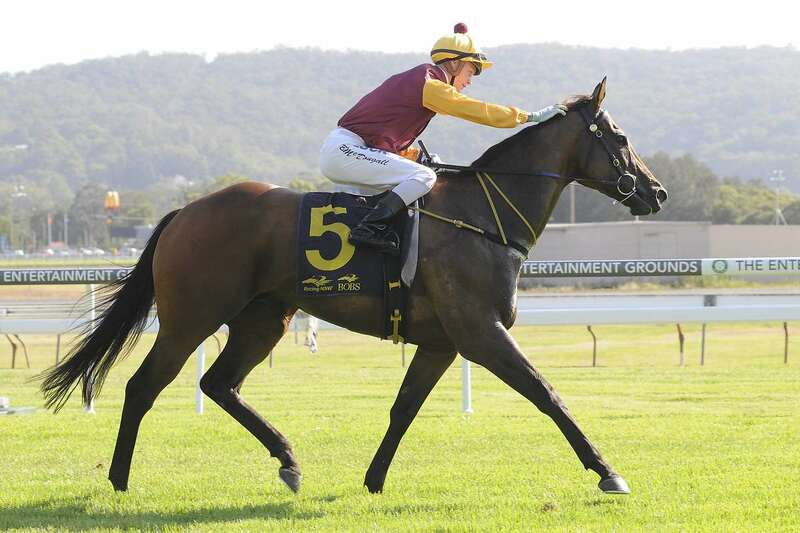 Gosford trainer Angela Davies is excited by the looming comeback of her talented but trouble-plagued galloper Waitandwatch at Friday's Port Macquarie Cup meeting, but fears the weather may cruel the seven-year-old's chances of making a winning return. Waitandwatch returns from an 11-month layoff in Friday's $50,000 De Bortoli Wines Port Macquarie Showcase Sprint (1200m), just the ninth start of a racing career which has so far netted five wins. "It's been a long haul to get him back and I couldn't be happier with him, but the weather is the concern," said the trainer. "I know we need the rain, but it has come at a bad time as far as my horse is concerned." The Port Macquarie track was rated a soft 5 on Wednesday, but further rain is forecast for Thursday and Friday. Waitandwatch obviously has plenty of ability, but his connections have had to be very patient as the gelding has battled a variety of issues, including shin soreness, a gashed knee and fetlock problems. "Be careful what you name your horses, because it could turn out to come true - we have certainly had to do a lot of 'waiting and watching' with this horse," quipped Davies. "He always seems to have something going wrong. He's just a soft-boned horse who has taken time to mature. "This latest lay-off came about after he had an operation to remove chips and clean up his fetlocks. He's been back in work about 16 weeks and I couldn't be happier with him. And he's really matured into a big, strong horse and is probably 30kg or so heavier than he was before the lay-off." Waitandwatch did not begin racing until late in his four-year-old season, winning at his second start at Wyong back on April 26, 2016. He really underlined his potential during his second preparation, remaining unbeaten in four starts, including a Randwick win on Boxing Day, 2016, and a terrific performance to land the $60,000 Malcolm Cusick Stakes (1200m) at Gosford on January 13, 2017. He was off the scene again for most of 2017 before his most recent run last December at Rosehill, when he pulled up lame after finishing down the track in a Benchmark 80. Waitandwatch has tuned up for his return to racing with three barrier trial wins, the latest over 1000m at Gosford on September 28. "He has always shown a lot of ability and I don't think he's lost any of that ability while he's been sidelined," said Davies. "He's trialled really well and I think this race at Port Macquarie is a nice race to start him off in. He's a 'one-day-at-a-time' horse, so we'll just see how he comes back and find some suitable races in Sydney and possibly Queensland over the summer with him." Davies is also looking for a good performance from her one other runner on Friday, last-start winner Maui Princess in the Class 1 Hcp (1200m). Maui Princess broke through at her second run this prep when she won her Maiden at Tamworth last time out on September 11: "She seems to have come back pretty well and should be competitive again on Friday," said Davies. Maui Princess will be partnered by leading Sydney jockey Tommy Berry, his only mount at the meeting other than the Chris Waller-trained Exoteric in the feature event, the $150,000 Carlton Draught Port Macquarie Cup (2000m). Waller nominated five horses for the Cup, but settled on just Exoteric as his only acceptor. The champion trainer is chasing back-to-back Port Macquarie Cup victories after landing the feature last year with Loving Home. Loving Home, now trained at Taree by Tess Wilkes, backs up again this year, but has been struggling to recapture his best form this campaign. The Gai Waterhouse-Adrian Bott stable will be represented by last year's runner-up Social Element, who looks primed to run another big race at his fourth run this time in. The Kim Waugh-trained Goathland and Richard Freedman's Shalmaneser, equal topweights in the 14-horse field with 58kg, both loom as leading contenders after their last-start efforts at Group Three level behind Miss Admiration in the Colin Stephens Quality (2400m) at Randwick on September 22.